The Shaheen Falcon is a resident subspecies of the Peregrine Falcon. 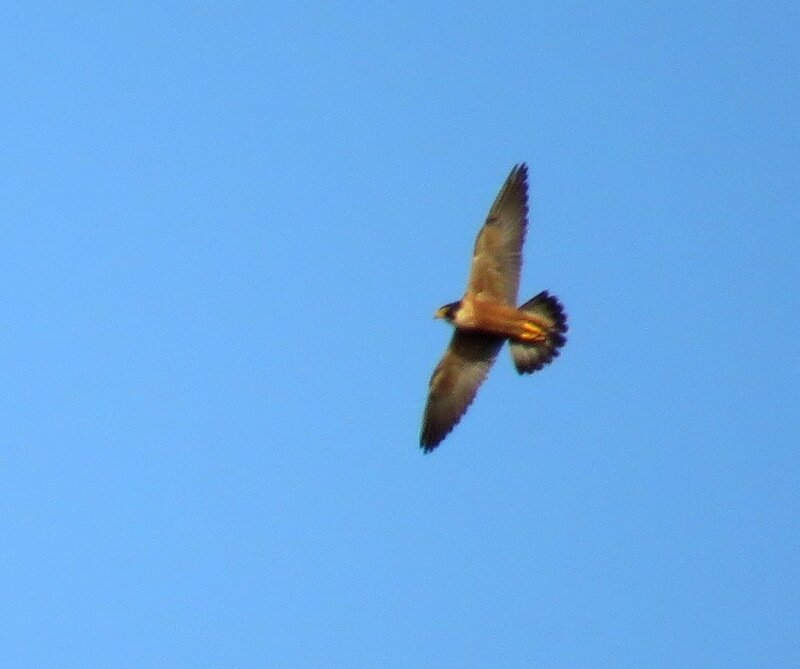 Last Sunday (3rd March), we had the opportunity to see a bird flying above us for about 3-4 minutes, hunting for its prey, much to the delight of the young birders. It is occasionally seen in Rishi Valley and I suspect it may be nesting in the rocky ledges in the Horsley Hills. The Common Kestrel is another falcon seen around our campus. It is a winter visitor. This year we have had few sightings and so I was delighted to see a male bird hovering in the mid-air in the Biodiversity park last week. This is a bird of the open country and loves to hover, beating its wings steadily, while looking for its prey – small rodents, lizards, insects and occasionally small birds. 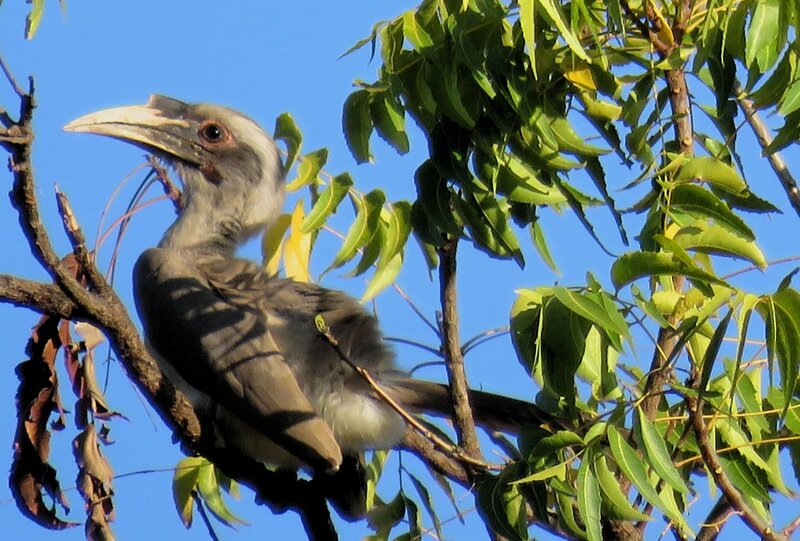 Last Sunday (24th Feb) we had a great time, observing the Common Grey Hornbills. Fortunately, it was still cool early in the morning and being sunny, the hornbills were sunning themselves and grooming and were least bothered by our presence. One of the birds was an adult bird with a fully developed casque and darker bill and the second bird had a rudimentary casque with paler bill. 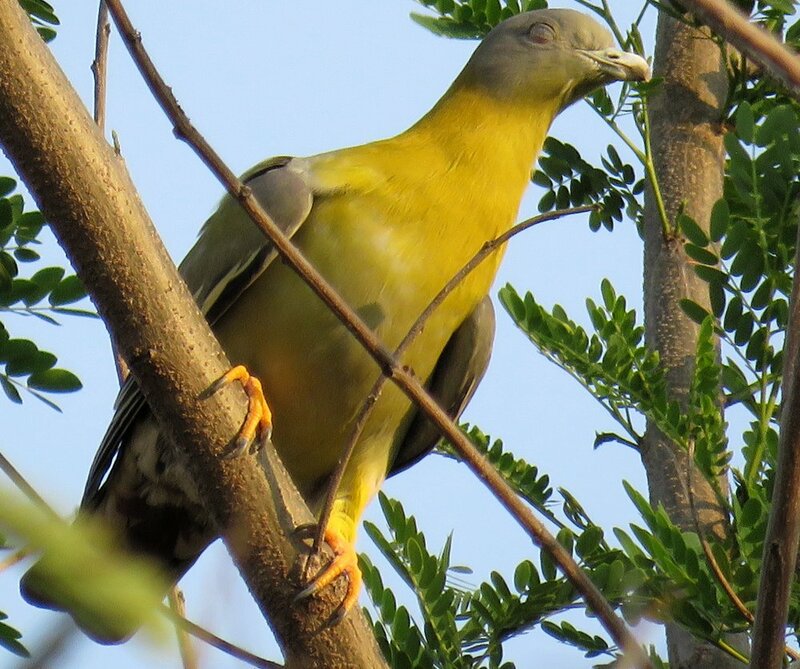 A new bird in the campus – the Yellow-footed Pigeon – was seen at Asthachal on 26th February. A colourful bird, this is a fruit-eater, which tracks down fruiting Ficus trees and wanders a great deal. A few months ago, this species had turned up at Diguvapalem and reported (with photos) by Nandhu. I have never seen this in RV before and am glad not just see it but also able to catch it meditating (see the picture) at the Asthachal! Now it seems to be the turn of the Red Silk Cotton tree to attract the birds to itself. There are not too many flowers unlike in the case of the Flame of the Forest tree (Palash) that I had written about sometime back. The lone tree is close to the “New” Guest House, next to the residence of Mr. Seshadri (our computer specialist). Treepies, black-hooded Oriole, ashy drongos, crows, mynas and a host of other birds have been visiting the tree for its nectar. Do take a look if you have the time. The flowers may be gone by next week. The reason why I started writing “RV Matters” on the school noticeboard was to draw the attention of “RVites” to things that happen around us on the campus. It was also a forum, which I hoped, would invite contributions from others – students and teachers - on their observations. Somehow this has not yet happened but I sincerely hope we will get them to write soon. However I do get feedback from some of the more active students and teachers on their observations – Yash (IX) reported a few days ago of about a chameleon being killed and consumed by a cat. Siddhu (XI) came up with a sighting of the Chestnut-headed bee-eater on the school campus last evening. Many observers have reported their sightings of the goings-on at the flame of the Forest (Palash) tree, still in flower, where congregations of parakeets, crows, sunbirds, Spangled or Hair-crested drongos have been noticed. A pair of Red Spurfowls that were trapped in the backyard of one of the hostels was rescued by the alert inmates. More reports are coming in of the sounder of wild boars behind the Badminton Court and I myself saw 5-6 of them one evening last week. Now with the Asthachal starting, there have been students who have been noticing birds and other creatures that we have been sharing our campus with. Nirvedh (VIII) came up with a long list of birds he heard or saw during the Asthachal, one evening. Again, Yash has been befriending a Black-naped hare at the Asthachal and it has been sitting in a shrub, mere 1.5 m. from him through the 20 minutes of Asthachal on more than three or four evenings! Yesteday, a skink joined the VIII students in their folk dance workshop! 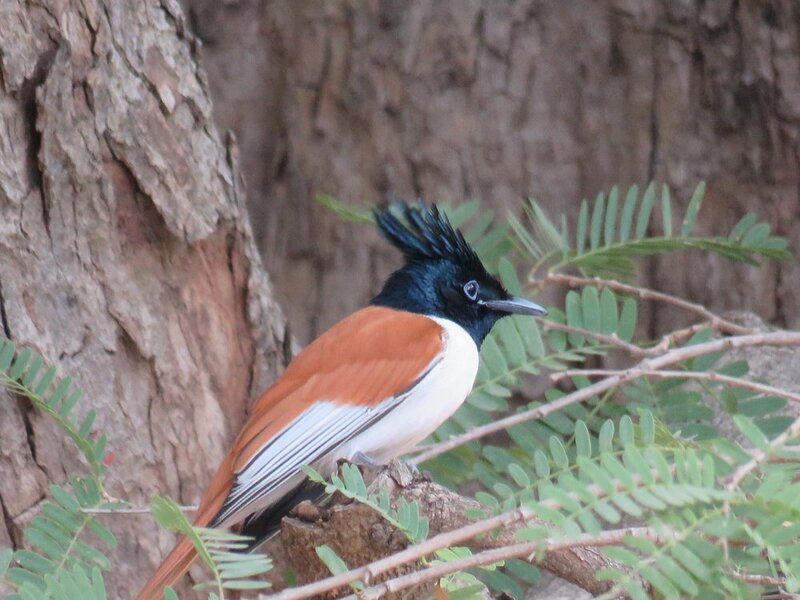 The Male Paradise flycatcher in the junior school seems to have taken on the role of a class inspector and has been entering the class-rooms and clearing them of spiders and other invertebrates besides listening to the goings-on in the class! Fortunately they now seem to know how to fly out of the rooms. A few years ago we had to remove the roof-tiles to release a bird trapped overnight in the room. They have been around in the foyer of the Senior School for years now, occupying the beam close to the tiles. They can be quite unobtrusive and with their mottled plumage, it takes a while to locate them on their secret perch, where they seem to be sleeping most of the day. 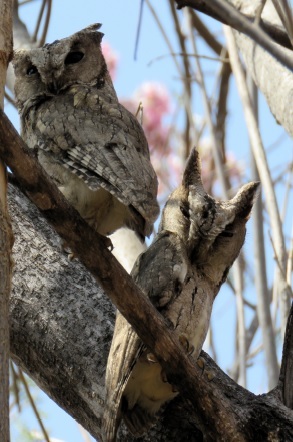 Yes, I am referring to the Indian Scops Owl (Otus bakkamoena) pair. The word “scops” is a Greek word that means small, eared owl. Last week, for once, they decided to leave their secret perch and bask in full sunshine. They were seen perched on the leafless branches of the Gliricidia tree in the courtyard. They were quite unmindful of my presence as I clicked these pictures but seemed uncomfortable when some students joined me. It was quite surprising that despite being out in the open, few people noticed them and they seemed to merge with the tree branches. These birds become active once the sun sets and at dusk, they come down from their perch and stretch their wings. They also perch on the frame of the large hoopoe portrait before flying out to hunt their prey, which is mainly small insects and animals. They have a characteristic call: “WUT?” which they utter at dusk and through the night. They can be noisier during the breeding season which is January-March. I have heard their repeated calls several times during the breeding season. They nest in tree-cavities. Time to look out for the flowers of the Flame-of-the-forest tree (Butea monosperma). This year, the lone tree on the tennis wall practice area is coming into bloom. The first flowers were out last week when I passed by the tree. In Rishi Valley, we have noticed the tree also attracts hordes of parakeets that chew up the seed-pods. We had tried several ways of preventing this but the birds have found ways to outwit us! Spotting a Paradise Flycatcher in Rishi Valley between the months of November and March is not a tough task. There are certain spots on campus where you could see the lovely male birds showing off their trim white and black plumage with a long pair of streamers trailing behind them as they dart around after their prey. Some males occur with a variant plumage* – upper parts being rufous (the colour of the female) instead of white but with long tail feathers. This year, I was fortunate in having two male birds haunting the tiny patch of greenery we have below our flight of steps and on the Tamarind tree in front of our house. One of them is the male in rufous morph but with white wings (primaries). He initially appeared in our neighbourhood in the mornings and late afternoons, perched on low branches, unmindful of the presence of people passing by or those sitting under the tree. Around noon he was replaced by an gorgeous white male with a pair of tail streamers, easily over 18 inches in length. He seemed a little more shy than his rufous counterpart. He would streak past like a comet when disturbed. Soon he took over the territory in the evenings too. Often he would be seen catching insects on the wing, flying low over the ground, much to the discomfiture of the resident White-browed wagtails that foraged on the ground. The Wagtails would then chase away the flycatcher which would retreat to another part of the tree. I have never seen the two males together. The male in the rufous morph moves over to the backyard of the Green House in the evenings. But I have once seen a female when the white male was around and he apparently had no objections to her presence in his territory. *Earlier it was presumed that the males with rufous colouration were juvenile males. But now it is established that males in rufous plumage too are capable of breeding and so are accepted as a colour morph. 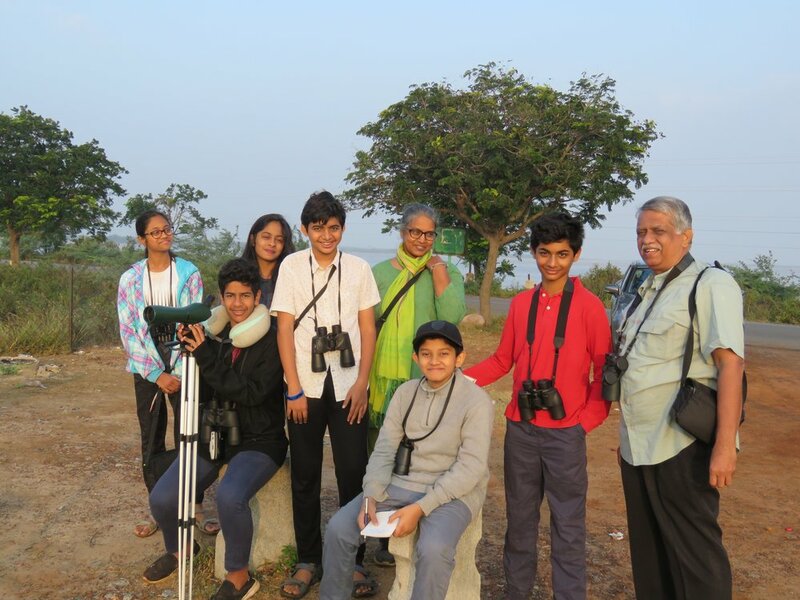 Some of the loyal, dedicated birders from Rishi Valley School were taken on a birding trip to Nelapattu and Pulicat Bird Sanctuaries on 6-7 January. We spent nearly two hours at the Nelapattu Pelicanry on 6th morning and had opportunities to watch the nesting colony of waterbirds comprising mainly Spotbilled Pelicans, Openbill storks, Black-necked Ibis, Spoonbills, a few cormorants, darters, egrets and night herons, besides several species of ducks including Lesser Whistling Teal, Garganey, Shovellers, Pintail and Spotbilled Ducks (which were not breeding) in the tank. In the fields adjoining the tank, there were Zitting Cisticolas, Indian Roller and a Marsh Harrier. That afternoon and the next morning, we made forays into the Pulicat lake, along the SHAR road, stopping by at the Kudiri Tank, a freshwater tank with reeds. We were greeted by flocks of flamingos (over 7000 birds, stretching towards the horizon and seen as a pink line), several smaller shorebirds numbering over 2000 that included stints, plovers and sandpipers, Painted Storks, more Pelicans, a flock of over 1400 pintail ducks, several egrets and herons. Our total bird tally exceeded 90 species in the two days and some of the kids got to see several “lifers” on this trip.